Butetown Medical Practice, was founded in 1997 by Dr Kay Saunders and Christine Read (Practice Manager and Business Partner). 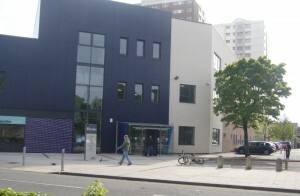 Butetown Medical Practice provides a range of primary medical services to approximately 8700 patients in the centre of Cardiff. It is a training practice which provides support and mentorship to doctors training to be GPs. If you are a GP interested in our vacancy, please also look at our recruitment page. Os nad yw’r wefan eisoes yn Gymraeg a hoffech chi fod. Yna, pwyswch y botwm sy’n dweud “Dewis Iaith” ac yna dewis Cymraeg / Welsh o’r rhestr. Our practice area covers Butetown, Grangetown, Atlantic Wharf, Cardiff Bay, and Windsor Quay. It is bounded to the North and West by the railway line, thus NOT including most of the City Centre. To the South its boundary is the River Ely. To the East it is the Central Link A4234 dual carriageway.